The team were up against some very strong competition, but at last night’s award ceremony in Bristol, Gigha Halibut were announced as the winners in the ‘Best Producer’ category for production of their outstanding fish, sustainable Atlantic Halibut. It’s been a slow but successful labour of love for Gigha Halibut owner, Alistair Barge. Not that rearing fish is anything new to Alastair. Having lived and worked on the picturesque shore of Loch Fyne for over 30 years, he was originally involved in farming Salmon. The switch to rearing sustainable organic halibut came after it became difficult to compete with the larger salmon producers. Unlike the cage based fish farming system, Gigha Halibut uses a unique system of land based aquaculture, where fresh seawater water is pumped into the enormous land tanks for rearing the fish. I went to visit Gigha Halibut and it was quite amazing to see production and follow the journey of rearing halibut at every stage.The journey from farm to plate, starts not on Gigha but at the hatchery on the shores of Loch Fyne on the West coast of Scotland. Here, Alistair and his small team nurture the eggs and larvae and after 60 days in the indoor tanks the tiny larvae are ready to begin live feeding. The organic diet uses 100% fish trimmings as a source of protein and organic vegetable products as the carbohydrate source. Accompanied by Marketing Director, Amanda Anderson, my day at the hatchery started with a guided tour around what is essentially the nursery. Alastair explained the different stages and cycles of growth, from tiny larvae, to the smallest of baby halibut and finally to more mature 1 year old fish ready for their journey to the Isle of Gigha. Two ferry trips later and we arrived on the Isle of Gigha where the fish continue to thrive after being transported to the island in tanks. It’s the most southerly of the Hebridean islands and the crystal clear sea water around the island seem to provide ideal conditions for growing halibut. 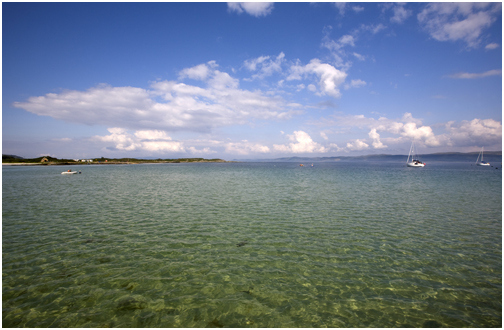 Looking out from Gigha Halibut to the beautiful crystal clear sea. The nurturing continues in the vast outdoor land based tanks, with a constant supply of fresh sea water being pumped and circulating through the system at 1400 litres per second. This provides the flowing current and conditions needed to replicate the natural habitat needed to produce this top quality, sweet and meaty fish. The power for this comes from the community windfarm on Gigha, again, another example of Alastair Barge’s sustainable commitment to the people he lives and works with. It was interesting to watch the natural behaviour of the fish congregating on the floor of the tanks, and it’s for this reason that the tanks have solid floors. Once resting on the floor, the halibut display a camouflage of white spots, making the shoal look similar to a a rocky sea bed and obviously in the wild a natural protection against predators. Fast forward four years from the larvae stage and it’s time to harvest. Producing happy halibut is a priority for Gigha Halibut and harvesting is done by hand on the island. Thereafter, the fish make their final journey to the mainland for processing and packing. With customers throughout the UK, Europe and the USA, there’s no shortage in demand for this high quality fish. Gigha Halibut can be found on the menu’s of some of the best restaurants in the country, including The Three Chimneys on the Isle of Skye and The Peat Inn, near St Andrews. Producing quality sustainable halibut is a painstakingly slow process, no machines or chemicals but with strong emphasis on key issues such as the environment and sustainability. Atlantic halibut stocks have suffered as a result of over fishing, 25 years ago 5000 tonnes were being landed, today that figure is reduced to 500 tonnes per annum. At Gigha Halibut, less than 75 tonnes of top quality halibut is produced in a year and looking at the company’s production methods and commitment to the environment and sustainability it’s easy to see why they were declared champions in this years BBC Food and Farming Awards ‘Best Food Producer’ category. 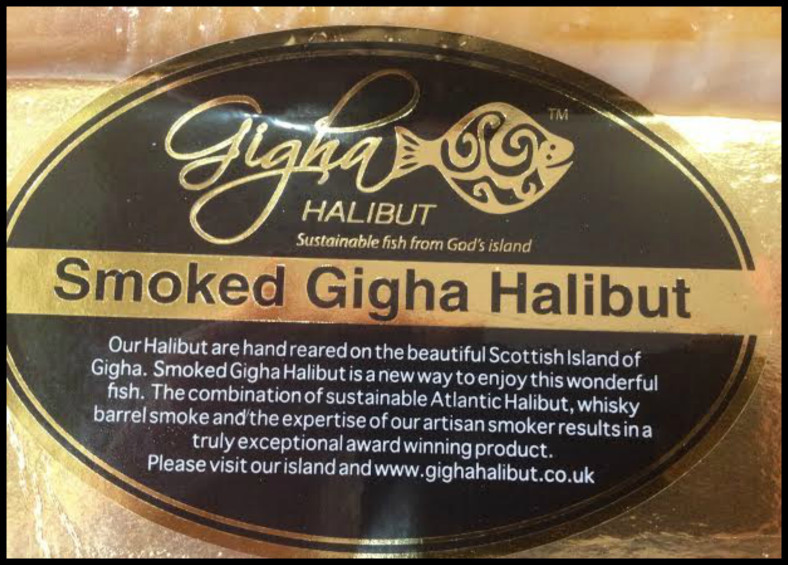 Gigha Halibut also produce an award winning smoked halibut. The fish is smoked to order in small batches and has become a real winner with customers and chefs. It’s a truly amazing product with a delicate but smokey flavour and is a perfect alternative to smoked salmon. I was lucky to bring some home from my visit and I’ll be telling you more about this award winning delicacy in the next post about Gigha Halibut.